An electronic fuel control for gas turbine engines. 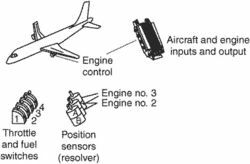 It sends out metered fuel to the engine for all flight conditions by sensing various parameters, such as the throttle position, engine RPM, atmospheric conditions, speed, and height. EEC prevents engine overspeed and overtemperature conditions. The common rail injection system and electronic engine control system make it possible to achieve fuel consumption levels of less than 200 g/kWh and very low exhaust emissions. com)-- Ultriva, a leading supply chain execution software company, recently announced that a major manufacturer of electronic engine control systems went live with ten more suppliers recently using Ultriva's cloud-based platform. A new integrated electronic engine control on the H80 engine enables single-lever power control, full auto-start capability and direct interface with the aircraft avionics system to further ease pilot workload. Features include Yanmar engines and electronic engine control units with three-way closed loop catalyst to meet CARB EPA certification requirements. Beginning with an overview of the use of computers in cars, the work discusses topics such as common components of computerized engine control systems, operating principles, diagnostic concepts and equipment, GM electronic engine controls, Ford Electronic Engine Control V system, Chrysler fuel injection systems, Bosch engine controls, Asian computer systems, and diagnostic strategies. It includes a software upgrade for the Electronic Engine Control and a new data entry plug. It is comprised of a software upgrade for the Electronic Engine Control (EEC), as well as a new data entry plug (DEP). Electronic engine control systems have moved into the mainstream as engine makers release new high horsepower outboards. While apologizing for the delayed recalls of Toyota's popular models over faulty gas pedals, Toyoda denied any link between reported sudden accelerations of Toyota vehicles and problems with the electronic engine control system. The US is now exploring evidence that could reveal problems with electronic engine control systems. The company won recognition for supplying the first fully electronic engine control system in Formula 1 when its revolutionary technology helped put Ayrton Senna's Toleman-Hart a very close second to Alain Prost in the torrential rain of the 1984 Monaco GP.